My thoughts on “Gachikoi Sorry”, the debut digital single from OPERETTA’S COUNTERATTACK. I think I’m doing a pretty good job of spicing things up so far in 2019 by adding some variety to the reviews that I’m posting. Naturally I’m still going to be reviewing most, if not all of the big releases that come out but I did make a commitment to try and cover some less well known stuff as well. That’s what I’m going to be doing here again this week as I introduce you all to yet another new group, or perhaps even remind a few of you that they still exist. The group in question is OPERETTA’S COUNTERATTACK (or Gyakushuu no Operetta), who are a three piece (or were, one of them just quit dammit!) that have been around for about a year now. 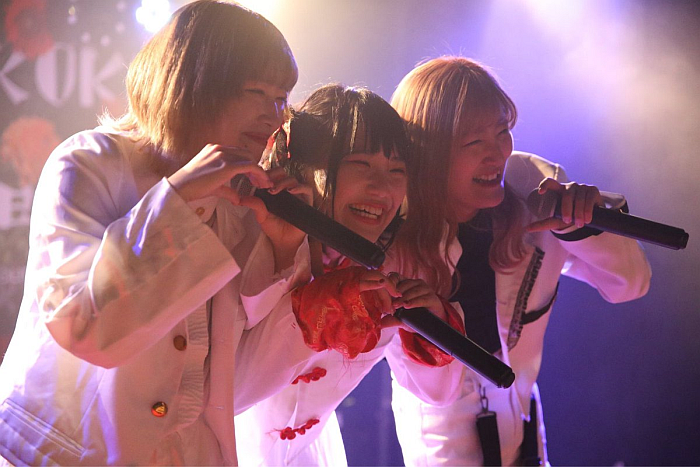 They’re signed to and managed by Gokigen Japan, which is run by Shirahata Ichiho of Gokigen Teikoku fame and OPERETTA are effectively Gokitei’s sister group. The line-up has had quite the wild ride over the past 12 months, with all manner of comings and going but the 3/2 members you see here today are the line-up that most people are probably going to be familiar with. “Gachikoi Sorry” is the group’s debut single, coming in the form of a digital download which seems to be the preferred method of single distribution for Gokigen Japan (and many others) of late. The song’s lyrics are written by Shirahata Ichiho and it is composed by DekaDai who has also done work for Gokitei in the past. It sure sounds like a winning combo to me and Ichiho has yet to let me down thus far so I’m feeling pretty optimistic coming into this one. I guess my only question mark is how the vocals are going to sound as I’ve yet to hear this group in a studio setting. I suppose there’s really only one way to find out. Right from the get-go the Ichiho/Gokitei influence is pretty apparent. The opening piano melody sounds fairly similar to “I NEET YOU” or “Kimi no Mei, Chikai no Yoru”, which is no bad thing in my opinion but I felt it was worth pointing out. The song transitions out of this and into a fairly soft Piano Rock style of arrangement, one that in my opinion could have used a little bit more definition because I felt myself really having to pay attention to be able to pick out certain elements of the instrumental. There was some pretty nice piano in there to be fair and I found the drumbeat to be pretty catchy and it provided the song with some nice energy. The synthesizers also gave an almost symphonic undertone to the song that I thought was pretty cool to listen to. A little too sparkly on the whole for my tastes but very enjoyable all the same. Vocally is where things get a bit more interesting. I say interesting because the way this song is structured and how the lyrics flow make it very apparent that it was written by Shirahata Ichiho. Be it the opening solo or the rather catchy chorus, the song bears many of her songwriting hallmarks. The problem that OPERETTA have, and it’s not particularly their fault, is that they don’t quite have the vocal power to pull off some of the things that this song is asking of them. Don’t get me wrong, they still do a great job but I do have to wonder how this song would sound if Gokitei were to do their own version. That being said, OPERETTA do bring a ton of energy and personality to the song and that’s more than enough to both bridge that particular gap and also make this a really fun listening experience. I’m probably being a bit too hard on them too for what it’s worth. As far as debuts go, this is a pretty solid one. Though it’s really hard not to draw comparisons between OPERETTA and Gokitei, especially with how involved Ichiho appears to be with both groups at the moment. I really hope that that, or me pointing out the things I did in this review doesn’t make people enjoy this song any less because I really do like it a lot and the OPERETTA girls are all very entertaining in their own ways. Hopefully we’ll still get another single or two from OPERETTA in 2019. We were supposed to get another digital single later this week but Melon’s sudden departure has put that on hold for now. It’s unfortunate but Shirahata hasn’t let setbacks like this stop this project before and it doesn’t look like she’s going to start now. Hopefully they’ll be able to pick up another member or two in the coming months and get back on track as there’s definitely a lot of potential here.